Retirement Investing Today: Can the British pound fall any further? At the time of writing sterling today had risen by 0.6% to be 1.5344 against the US dollar. Part of the contributor to this was a fall in UK unemployment of 33,000 for the 3 months to January 2010 putting unemployment at 2.45 million or 7.8% today. Now I don’t watch this indicator regularly however if you read into the figures a little deeper it doesn’t look all rosy to me. to balance out the losses I can’t see how this latest news is good for the economy or GDP. - Prudential's bid of £23.5bn for AIG's Asian business may mean the company will sell sterling and buy US dollars to finance the deal. In a morbid kind of way I hope that we get a hung parliament, indecision / bickering of the parties prevail leading to the debt not being addressed, a bond strike or similar occurs and the International Monetary Fund (IMF) has to bail us all out. In my opinion in the longer term this could be a better option as they would at least make us take our medicine. This would cause a lot of short term pain while maybe the housing market corrected itself, those who had over leveraged themselves went bankrupt, the bloated public sector was cleared out and the zombie banks (who would be bankrupt if they were a private company) were wound down. However, once this had happened then we would be at the bottom of the economic cycle and the economy would then be in a position to grow strongly again. This brings me to my chart today. 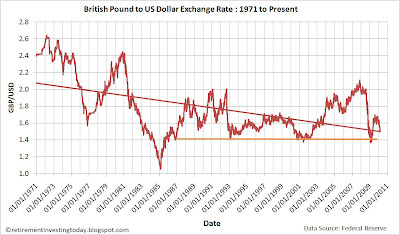 There is plenty of talk around at the moment about the low value of sterling however the trend line of my historical chart showing sterling to the US dollar suggests that sterling has been in a long term decline against the dollar since 1971 and is now about on trend. The rate is however lower than the arithmetic mean of 1.787. The final point I will make is that the chart shows a lot of resistance at around the 1.40 mark however there is also plenty of downside potential from here when looking at history. In February of 1985 the rate was as low as 1.052. Now that would affect the price of the fuel in your car, a bottle of Australian red wine or that holiday to France. It would certainly make anybody earning sterling feel a lot poorer. didn't labour go cap in hand to the imf in 76 after the second election when the got a working majority.i don't think hung parliament=imf. Thanks for correcting my history. That's what I get for not even being in school at that time... Some more detailed research revealed the last hung parliament was the February 1974 election. The hung parliament was over by October 1974 when an election was called and Labour won with a very small majority. The IMF bailout wasn't until 1976 with Labour still in power. I agree that a hung parliament doesn't necessarily mean the IMF turn up at the door. Lots of countries survive with coalitions or similar and don't need the IMF. Blog post updated at 21:27 17.03.10 to correct error.